Biochemist David Deamer has been studying the origins of life for more than 20 years. Researchers in the field of synthetic biology are still a long way from being able to assemble living cells from scratch in the laboratory. But according to biochemist David Deamer of the University of California, Santa Cruz, their efforts are yielding clues to the mystery of how life began on Earth. Deamer has been investigating the origin of life for more than 20 years, focusing on the molecular self-assembly processes that led to the first "protocells" nearly 4 billion years ago. At the annual meeting of the American Association for the Advancement of Science (AAAS) in Chicago, he discussed evolution, biochemistry, and the origin of cellular life. His presentation on February 15 was part of a symposium on evolution organized by Eugenie Scott, director of the National Center for Science Education in Oakland, Calif. According to Deamer, life began with complex systems of molecules that came together through the self-assembly of nonliving components. A useful metaphor for understanding how this came about, he said, can be found in combinatorial chemistry, an approach in which thousands of experiments are carried out in parallel by robotic devices. "I look at the origin of life as the result of combinatorial chemistry on a global scale," said Deamer, a research professor of chemistry and biochemistry at UCSC who is also affiliated with the Department of Biomolecular Engineering in UCSC's Jack Baskin School of Engineering. The power of combinatorial chemistry lies in the vast numbers of structurally distinct molecules that can be synthesized and tested at the same time. Similarly, conditions on the early Earth allowed not only the synthesis of a wide variety of complex organic molecules, but also the formation of membrane-bound compartments that would have encapsulated different combinations of molecules. "We have made protocells in the lab--artificial compartments containing complex systems of molecules," Deamer said. "The creationists charge that it's too unlikely for the right combination to have come together on its own, but combinatorial chemistry gives us a better way to think about the probability of life emerging from this process." Life began when one or a few protocells happened to have a mix of components that could capture energy and nutrients from the environment and use them to grow and reproduce. Efforts to replicate this process in the laboratory are still in their infancy, but Deamer said he is optimistic that scientists will eventually be able to assemble a living cell from a parts list and thereby achieve a better understanding of how life began. The first forms of life did not evolve in the usual sense, he said, but simply grew. "Evolution began when large populations of cells had variations that led to different metabolic efficiencies," Deamer said. "If the populations were in a confined environment, at some point they would begin to compete for limited resources." The first evolutionary selection processes would have favored those organisms that were most efficient in capturing energy and nutrients from the local environment, he said. In his talk at the AAAS meeting, Deamer outlined the conditions that scientists think were necessary for life to emerge on the early Earth. 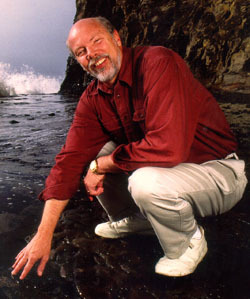 He is currently working on a book about the origin of life to be published by UC Press. Note to reporters: You may contact Deamer at (831) 459-5158 or deamer@hydrogen.ucsc.edu.